Campos, who by his own admission to a Las Vegas Metropolitan Police Department detective during his recorded interview, stated that he discovered the bracket that was drilled into the Mandalay Bay Hotel 32nd floor fire stairwell door with screws, prior to Stephen Paddock opening fire. Campos told the LVMPD detective that he then heard drilling noises coming from deep inside Paddock’s suite, Room 32-135, and walked away without investigating the suspicious noises. I wonder if that’s why Campos failed to do his job when he didn’t stop to investigate the suspicious “drilling” noises inside Paddock’s suite after he had just observed the bracket that was screwed into the fire exit door. 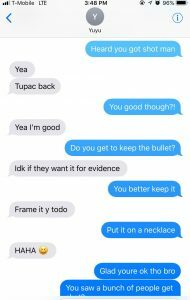 Campos’ former brother-in-law, Luis Castro, provided the Baltimore Post-Examiner with screenshots of text messages between Campos and himself, sent after the October 1, 2017 Massacre. The Baltimore Post-Examiner reported in a previous story that that statement in the LVMPD final report conflicts with what Mandalay Bay Hotel Engineering Supervisor Shannon Alsbury told the police during his interview. 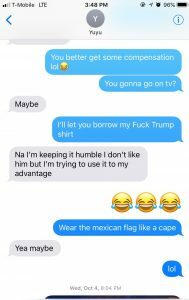 Alsbury said that Campos told him he heard the drilling noises while on the phone with him, before Campos hung up. That statement continues to bother me. It makes no sense. Campos heard automatic fire, then thinks he was shot with a BB or pellet gun? Just to clarify what the LVMPD wrote in their final investigative report. When Campos called in over his radio he did not say that he was shot at that time. Campos said over his radio in a very calm and relaxed voice that shots were coming from Room 32-135. All who died were shot according to final Coroners report. What was being ‘drilled’ deep inside the room? The bracket was already in place. The peep hole camera didn’t need a hole did it? Why is this not addressed in Metro’s report? Where is the ‘shrapnel’ from a rifle round – or was it a BB or pellet? Officer Clarkson also got hit by shrapnel – scratched on the neck by the descriptions given. 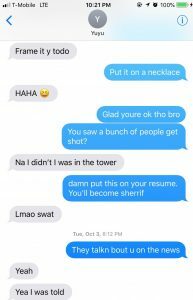 Was that shrap/evidence maintained? Sheriff Lomardo once said ‘hundreds’ of round had been fired through the door…in reality, there are about 30 holes…so was the door open? How did Trump’s name come up? Was there talk that this tragedy was supposed to send an anti-gun message? And on and on and on…Thanks goodness Doug Poppa will get some answers!